The Nigeria Spelling Bee Competition has announced the commencement of Registration for all Primary and Secondary Schools for the 2018/2019 academic session. 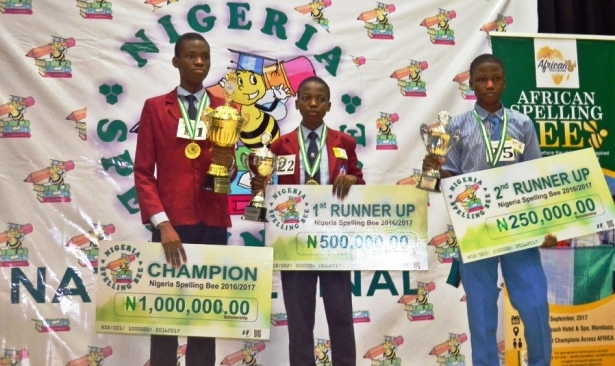 The Nigeria Spelling Bee is a product of Bee Spelling Competition Initiative, a registered Non-Governmental Organization with the Nigerian Corporate Affairs Commission. The organization is worried about the common mistakes students make and even writers in the usage of English words and the three major Nigerian languages. This is the reason for organizing spelling competitions among Nigerian secondary school students, to promote accurate spelling of the commonly used words and improve the knowledge of students. Students at the level of junior secondary school and those in senior secondary schools are eligible to take part in the competition. The competition shall be held at state, zonal and national levels, where winners at every stage shall be rewarded with prizes accordingly. NOTE: Online Registration for 2019 Season Commences on 1st October, 2018. The Nigeria Spelling Bee is open to all students in both public and private schools in Nigeria. All spellers will be asked to spell individually irrespective of the number of spellers from the same school. From this Season (2019 Season), the Nigeria Spelling Bee will be divided into two distinct categories. 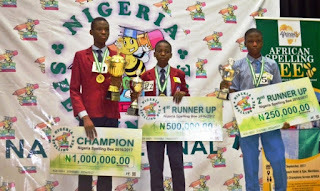 The 3 best spellers from each category will represent Nigeria at the 2019 African Spelling Bee. Please study these rules and act according for training and practice purposes. Must attend a Primary or Secondary School in Nigeria. Spellers may register under their schools or privately but must supply their school details. Spellers who will be in Final Senior Secondary School (SS3) as at 2018/2019 academic session or have passed Senior Secondary School 2 (SS2) are not eligible. The organizers of the Nigeria Spelling Bee may disqualify, prior to, during, or after the competition, any speller who is not in compliance with any of the Eligibility Requirements or rules of the competition. Registration is online on our e-portal upon the payment of N2,000 (Two Thousand Naira) only per speller. Schools registering a group of more than 10 spellers should contact 08032478894 or 09056623866 or email info[at]nigeriaspellingbee.com for school discount. All payments should be made to our official bank accounts as displayed on our website. No payment should be made directly to any person claiming to act on behalf of Nigeria Spelling Bee. All spellers will be given a unique SPELLER ID on the “Confirmation Page” after submitting the form. All Spellers are advised to keep their Proof of Payments and come with same to the competition venue. Spellers are advised to register early and download the Study Guide and start practising early. Spellers are required to study for English words by studying the Study Guide for this season which is available after registration. Note that The “Oxford Advanced Learner’s Dictionary, New 8th Edition, (Windows Application)”. This is the sole source of words and adjudication criteria for this season. The competition at state and regional levels may run into late evenings, schools are adviced to inform parents and make provision for spellers. Spellers are required to Print the Registration Confirmation page after submitting the e-Registration form. Spellers are required to upload a recent passport photograph during registration as it will be used to identify spellers during the competition. Go to any First Bank Plc Branch anywhere you are in Nigeria. Pay the e-Registration Fee of N2,000 only into the below details. Keep your teller securely as it would be used to fill the e-Registration form. Schools can make bulk payments for all their spellers (ex: N6,000 for 3spellers, N40,000 for 20spellers, etc). Contact 09056624866 for a discount for more than 10 spellers. The security of your teller/teller number is your responsibility. Nigeria Spelling Bee will not accept any liability arising from any loss caused by exposing or sharing your teller number to another person. Also, note that there will no refund after payment. You can make payment using an ATM card at the comfort of your home or office for your child/student/sibling using the secured Quickteller / Paystack payment gateway button below. Upon payment of registration fee, click the button below to register. After registration, each speller will have a Unique Speller-ID used to identify the speller on the competition stage. Please use a computer with a printer to register each speller and print out the Confirmation Slip. You are expected to bring along the Confirmation Slip along with proof of payment to the competition venue. Spellers will be contacted concerning the details of the competition in their preferred venues. Top Spellers at the State Qualifiers will participate in the Regional Qualifier in their respective regions. Top Spellers at the State Qualifier will be informed of the state of the Regional Qualifier. Top Spellers at the Regional Qualifiers will be informed of the State where the National Finals (Grand Finale) will hold. a. Round 1 is a non-elimination round and is a multi-lingual round using the word list with words from the 3 major languages of Nigeria (Hausa, Igbo and Yoruba). b. For the Yoruba, Hausa and Igbo words used in the competition, the Spellers are strongly advised to download and print them to study after submitting the e-Registration form. d. The Indigenous Languages will not be used to eliminate in the State and Regional Qualifiers. a. Round 2 and all subsequent rounds will be elimination rounds using English words only. b. For the English words, Spellers are advised to download and study the Study Guide for this season after successful registration. This will serve as a base guide for spellers to study for the competition. c. Finalists will be given additional study materials that will be used for at the National Finals. d. Spellers are also advised to read and study broadly for the competition. Spellers are required to be very audible and clear on their spelling. Spellers are required to pronounce the word after they have spelled it to indicate that they are through with the spelling. (A speller may be disqualified for not pronouncing the words after spelling within the time frame). A Speller has 60 seconds to spell his/her word and pronounce the word after starting to spell the first letter. Spellers are advised to make use of these rights and responsibilities and not rely only on pronunciations. A speller can NOT change the order of the letters in a word after pronouncing the letters during spelling. Officials may disqualify any contestant who ignores a request to spell his/her word after a reasonable length of time. The Spelling Bee will be conducted primarily in English. In the event of any complaint, suggestion or need for clarification, such should be directed to the adjudicator. Complaints concerning the spelling of a word must be brought up before the end of the current round. Both American and British spelling of words will be allowed and the Concise Oxford English Dictionary will be used in the competition as the final authority. 1. National Champion: Wins 1 Million Naira in Scholarships + Documentary on Champion's School + Books for the Champion's School Library + Nigeria Spelling Bee Ambassador for Life. Lots and lots of other consolation prizes are up for grabs. Every participant will also be recognized with our certificates.